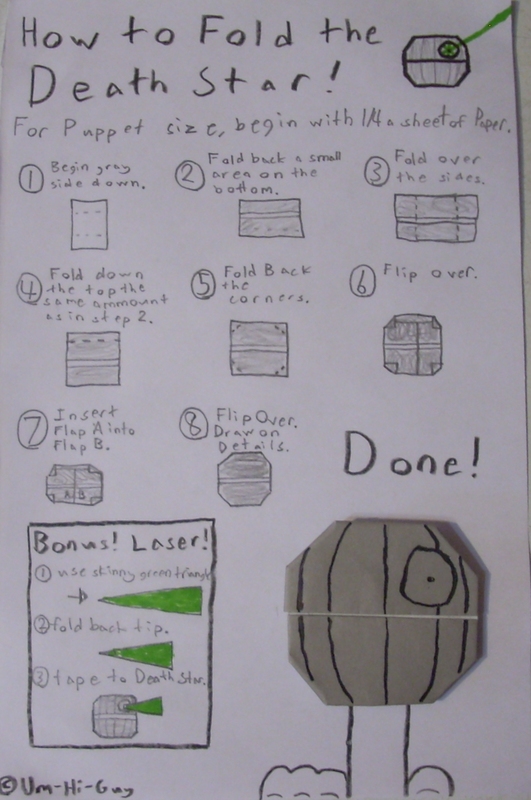 These are instructions for my origami creations. Not sure how to help with that. it’s rather straightforward. where’d teh cover yoda instrux go! This site has never had instructions for the Cover Yoda. No offense, but your grammar is abysmal. Um, I think I understood that… If you’re having trouble with an image loading, I’m afraid I can’t help you. 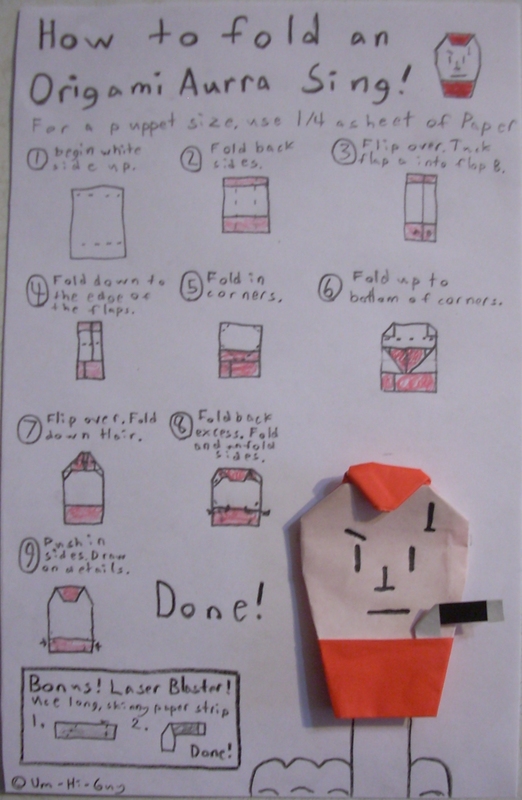 Can you post instructions for your Origami Weeping Angel? why is the mandolorian so hard!!!!! 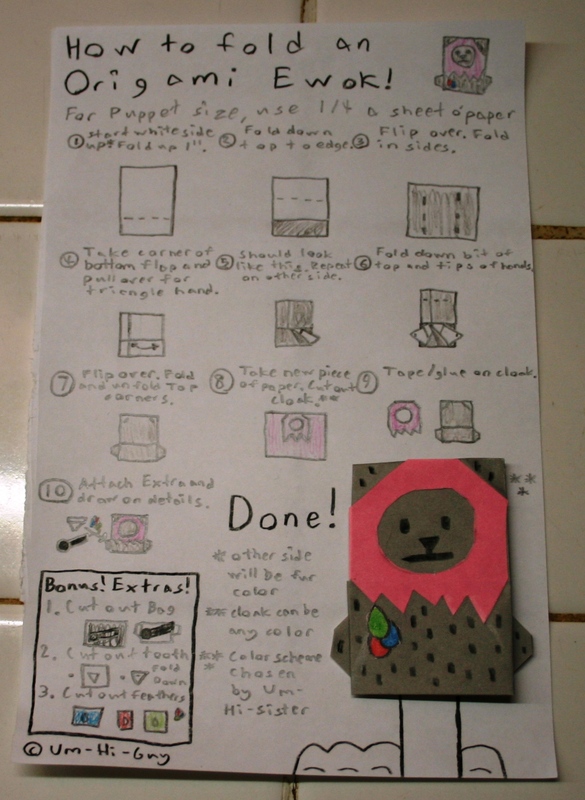 do i have to get the right and perfect paper for it??????? It’s simply a difficult fold. Unfortunately, I have no easier method of making it. 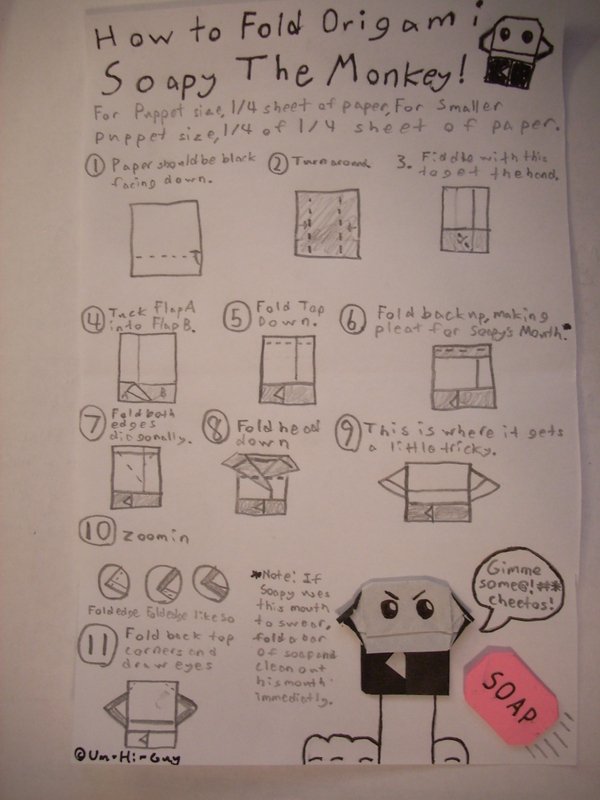 can you tell us how to make the jawa on the origami page??? My Jawa is a puzzlement. I can’t find the balance between cruddy design, and incredibly difficult design. So I’m afraid not. 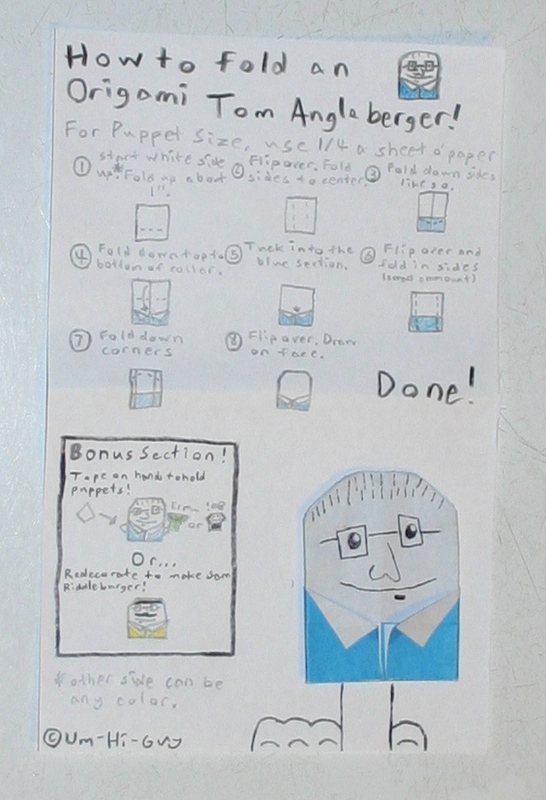 um hi guy whats you best origami puppet ? 1. 4-Lom is similar to the Mandalorian, minus a few folds. I could make instuctions if I recieved enough interest. 2. Jabba’s Rock Band consists of Max Rebo (the blue elephant like guy in episode VI) and the Cantina Band from episode IV. Both are difficult folds. I’m not even sure how I folded Max anymore. So that’s a bit unlikely. 3. Bossk is difficult because of his mouth. It consist of a series of pleats folded in on themselves, like the Deluxe Yoda’s eyes in reverse. Not too easy to fold. But I might make instructions if I got enough interest. 4. Lando is, essentially, Tom’s Han Foldo with a different color scheme. 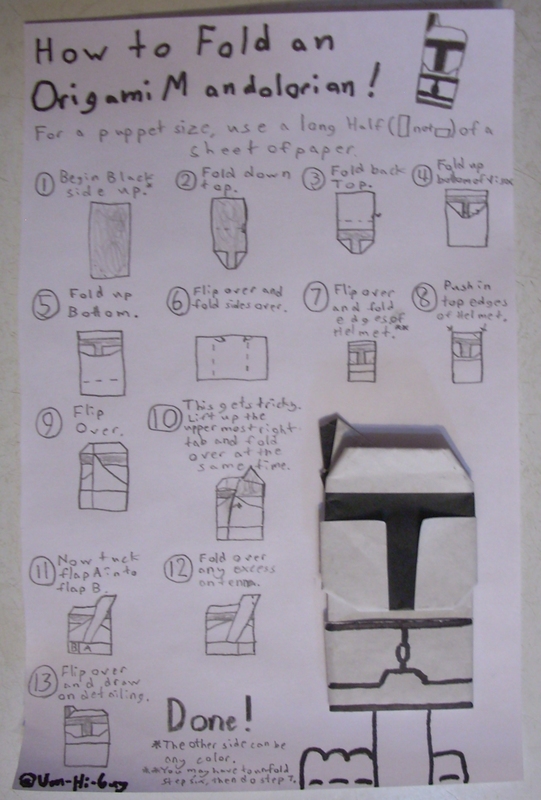 Thus, not much reason to make instructions. 5. My Jawas are always either too good or not good enough. Of the two models I posted, the first isn’t worth folding and the second is too complicated. I’m still working out a middle ground. 6. As for how many I’ve created, I would have to rummage in the plastic tub I keep them all in for a good half hour just to answer that. Perhaps at a later time, but right now I’m too lazy. you should do a case file!!!!!!!!!! Tempting… But I have no idea what it would be about. You know, if you color the mandalorian green, he’ll Boba Fett!!! I thought Aurra Sing was a girl. any more cool instrux ! I made a poster of soapy. There is him saying a swear, and the top say’s “wash his mouth out with soap!” and you stick the soap in his mouth. I might post a picture of it on the Internet. Hey Um Hi Guy. Doy you go onto Xat chats? if you dont, please reply and i will tell you a like to my chat! thx! Okay, there should be two flaps, one overlapping the other. Tuck the top one into the bottom one. Does that help? Yes! Thanks! But….. on my death star, i dont have two flaps. but i dont care! it still works! thanks! Sorry, I try to keep to myself.